Is everyone surviving the polar vortex? Not to rub it in, but here in San Francisco we have winter fashion a bit easier than those in the midwest ect - I mean we can actually leave our homes without wearing a snow jacket. 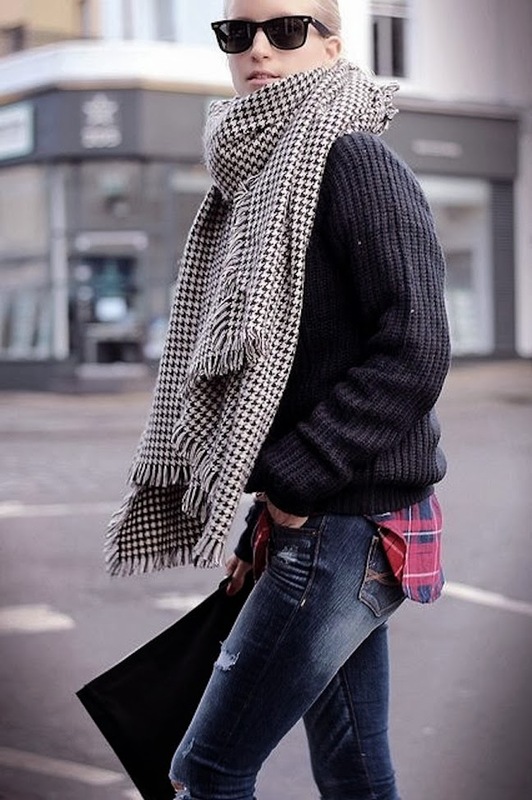 These casually cool street style looks left me inspired to find an oversized plaid or houndstooth scarf to bundle up in. Paired with a chunky knit sweater or leather moto jacket, jeans and Wayfarers, oversized scarves make the perfect accessory to brave the winter weather in. I lovee oversized scarves that basically double as blankets - so cozy! I have a few of these oversized scarves and adore them. The look is fab! Although they are oversized, they are really pretty.